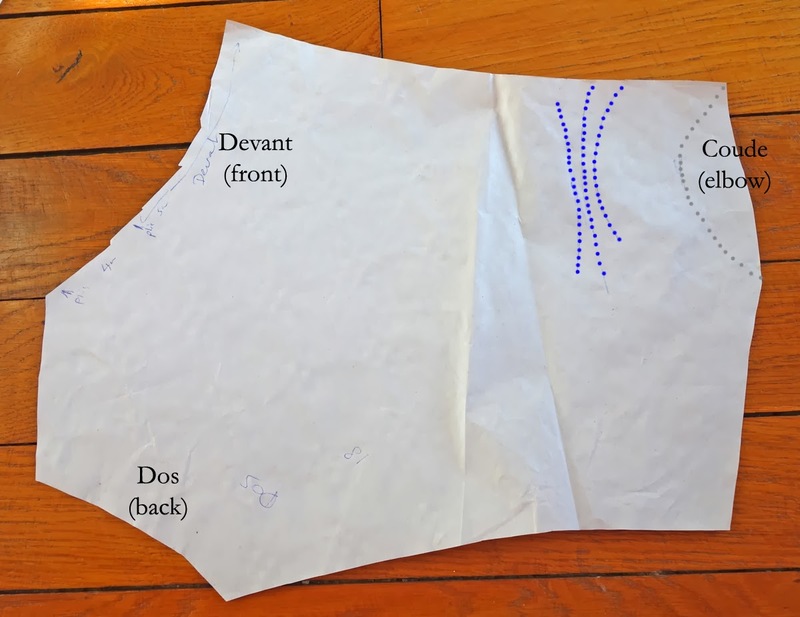 Suite et fin de l’étude de la robe 18e (présentation ICI, patronnage ICI et dos & plis ICI) concernant le point le plus casse-pied sur les costumes 18e : les manches ! End of the study for this 18th century dress (introduction HERE, pattern making HERE and back & pleats HERE) about the most boring point on costumes : sleeves ! Raccordement au corsage, vue intérieure. Connecting to the bodice, inside view. – au dessus du coude, présence de 3 plis (pointillés bleus) pour relever le bord de la manche au niveau des pointillés gris, ce qui permet au coude de se plier sans problème. – 3 folds above the inside of the elbow (blue dotted lines) to raise the border of the sleeve to the grey dotted line, what allows the elbow to fold easily. Fantastic. Sleeves actually can be interesting. In this case there is evidence of them having been repaired or redone. The patch at the corner of the inside, next to the shoulder strap, is interesting. For the next in the series, how about another 18th century garment to contrast this one with? Constrasting two garments can tell even more about the garments than showing the two entirely independently. Also, there are fewer reviews of extant 18th century garments than there are of 19th century ones. or so it would seem.